The tubulin homolog FtsZ (Filamenting temperature-sensitive mutant Z) protein is an essential prokaryotic cell divison protein. FtsZ is a GTPase that polymerizes in a nucleotide-dependent manner head-to-tail to form single-stranded filaments that assemble into a contractile ring called the Z-ring. This ring forms on the inside of the cytoplasmic membrane where it marks the future site of the septum of a dividing bacterial cell and is dynamically maintained through the course of cell division by continuous and rapid turnover of FtsZ polymers1-3. FtsZ is the first protein to localize at the division site and recruits other proteins involved in bacterial cell division. Besides serving as a scaffold for other cell division proteins, FtsZ itself may exert cytokinetic forces that lead to cell division1-6. Given FtsZ's essential role in bacterial cell division, it has recently become a novel target in the development of new antibiotic and anti-microbial agents7-12. The unprecedented increase in antibiotic-resistant pathogens and lack of new antibiotic development highlights the need for new anti-microbials active against novel targets such as bacterial cell division proteins9,13. Due to its novelty as a drug target, compounds targeting FtsZ would not be affected by current drug-resistance mechanisms14. Initial FtsZ drug screens focused on drugs that inhibit eukaryotic tubulin polymerization given the functional and structural overlap between tubulin and FtsZ14. There is little danger that an anti-FtsZ compound would also be anti-tubulin since FtsZ and tubulin only share 10-18% sequence similarity1,14-16. Currently, there are a multitude of compounds being evaluated as FtsZ protein inhibitors, including both synthetic small molecules (e.g., PC190723), polypeptides, and inhibitors derived from naturally occurring agents, as well as nucleic acid inhibitors of ftsZ gene expression17,18. To date, the only protein X-ray crystallography data for a FtsZ inhibitor are PC190723-Staphylococcus aureus co-crystals19,20 (Fig. 1). PC190723, a benzamide derivative, potently inhibits S. aureus and Bacillus subtilis FtsZ proteins via binding in a cleft between the C-terminal domain and helix 7 in a region analogous to the Taxol binding site of tubulin17,19-21 (Fig. 1). These results suggest that the highest degree of binding is achieved when FtsZ is bound to a nucleotide and polymerized, suggesting that PC190723 inhibits FtsZ by first enhancing FtsZ polymerization and then stabilizing the polymers, thus preventing the necessary dynamic changes in FtsZ polymers for bacterial cell divison8,17,20. The inactive FtsZ is mislocalized and instead of being localized in the middle of the cell, is distributed in distinct puncta, throughout the elongated cell. The major drawback to PC190723 is that it binds in a region of FtsZ that is prone to spontaneous anti-microbial resistance mutations (Fig. 1), meaing that compounds that bind here may present a limited ability to inhibit FtsZ. For this reason, analogs of PC190723 have been synthesized (e.g., TX707) and prodrug versions of PC190723 (i.e., TX541) and TX707 (i.e., TX709) were also developed and found to be effective against S. aureus; however, their effectivness as broad-spectrum anti-microbials does not seem likely as they are not active against other Gram-positive and Gram-negative pathogens. In addition to these compounds, other potential FtsZ inhibitors in the midst of various stages of development, production, and testing include synthetic anti-FtsZ inhibitors such as tri-substituted benzimidazoles and peptide-based compounds, as well as nucleic acid-based compounds that inhibit ftsZ gene expression, in contrast to targeting the FtsZ protein as the other candidates do14,17,18. Figure 1. Crystal structure of the S. aureus FtsZ/PC190723 complex. Figure adapted from reference 19. 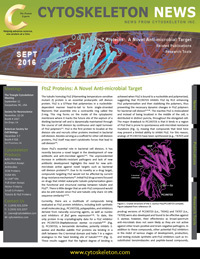 While these recent studies offer hope that targeting FtsZ proteins (or the ftsZ gene) will bear fruit in efforts to create antibiotics and anti-microbials against specific bacteria, current work does not support the hypothesis that targeting FtsZ wil lead to the identification and development of broad-spectrum anti-bacterial drugs. Indeed, the amino-acid sequence identity between different FtsZ species is 35 to 99%, and most commonly 40 to 60% (see http://www.cytoskeleton.com/pdf-storage/info-res/ftsz-identity.pdf for an homology database). Instead, using one FtsZ protein target will likely generate a highly specific drug to that species. For example, Haydon et al.21,22 reported that PC190723 inhibited FtsZ from S. aureus and B. subtilis (70% identity to each other), but not from Escherichia coli (51% and 47% identity, respectively). Much remains to be done in pursuing anti-FtsZ drugs and translating the work of medicinal chemists into specific FtsZ inhibitors that can be tested preclinically and finally in the clinic. It is important to use a rational drug discovery process, which requires structural and kinetic analyses of FtsZ binding compounds (i.e., inhibitors) and mechanistic studies of anti-FtsZ compounds. Several types of assays have been used to measure FtsZ polymerization, including GTPase, fluorescence quenching, FRET, sedimentation and light scatter assays. The requirements for drug screening applications are best served by the GTPase assay and fluorecence quenching formats. Cytoskeleton, Inc. offers purified, active FtsZ proteins from multiple bacteria as well as custom services that can produce needed FtsZ proteins and/or perform screenings of anti-FtsZ compounds. For additional information about these FtsZ proteins and services, a table of FtsZ-relevant assays, and sequence homologies between different FtsZ proteins, please see www.cytoskeleton.com/ftsz. Romberg L. and Levin P.A. 2003. Assembly dynamics of the bacterial cell division protein FtsZ: Poised at the edge of stability. Annu. Rev. Microbiol. 57, 125-154. Erickson H.P. et al. 2010. FtsZ in bacterial cytokinesis: cytoskeleton and force generator all in one. Microbiol. Mol. Biol. Rev. 74, 504-528. Mingorance J. et al. 2010. Strong FtsZ is with the force: mechanisms to constrict bacteria. Trends Microbiol. 18, 348–56. Osawa M. and Erickson H.P. 2006. FtsZ from divergent foreign bacteria can function for cell division in Escherichia coli. J. Bacteriol. 188, 7132-7140. Erickson H.P. et al. 1996. Bacterial cell division protein FtsZ assembles into protofilament sheets and minirings, structural homologs of tubulin polymers. Proc. Natl. Acad. Sci. USA. 93, 519-523. Erickson H.P. 1997. FtsZ, a tubulin homologue in prokaryotic cell division. Trends Cell Biol. 7, 362-367. Margalit D.N. et al. 2004. Targeting cell division: small-molecule inhibitors of FtsZ GTPase perturb cytokinetic ring assembly and induce bacterial lethality. Proc. Natl. Acad. Sci. USA. 101, 11821-11826. Andreu J.M. et al. 2010. The antibacterial cell division inhibitor PC190723 is an FtsZ polymer-stabilizing agent that induces filament assembly and condensation. J. Biol. Chem. 285, 14239-14246. Kumar K. et al. 2010. Discovery of anti-TB agents that target the cell-division protein FtsZ. Future Med. Chem. 2, 1305-1323. Sass P. et al. 2011. Antibiotic acyldepsipeptides activate ClpP peptidase to degrade the cell division protein FtsZ. Proc. Natl. Acad. Sci. USA. 108, 17474-17479. Mathew B. et al. 2011. Novel pyridopyrazine and pyrimidothiazine derivatives as FtsZ inhibitors. Bioorg. Med. Chem. 19, 7120-7128. Schaffner-Barbero C. et al. 2011. Targeting the assembly of bacterial cell division protein FtsZ with small molecules. ACS Chem. Biol. DOI: 10.1021/cb2003626. Mintz C. 2011. Why the antibiotic discovery business needs to be revamped. Life Science Leader. http://www.lifescienceleader.com. October 2011. Huang Q. et al. 2007. FtsZ: A novel target for tuberculosis drug discovery. Curr. Top. Med. Chem. 7, 527-543.
de Pereda J.M et al. 1996. 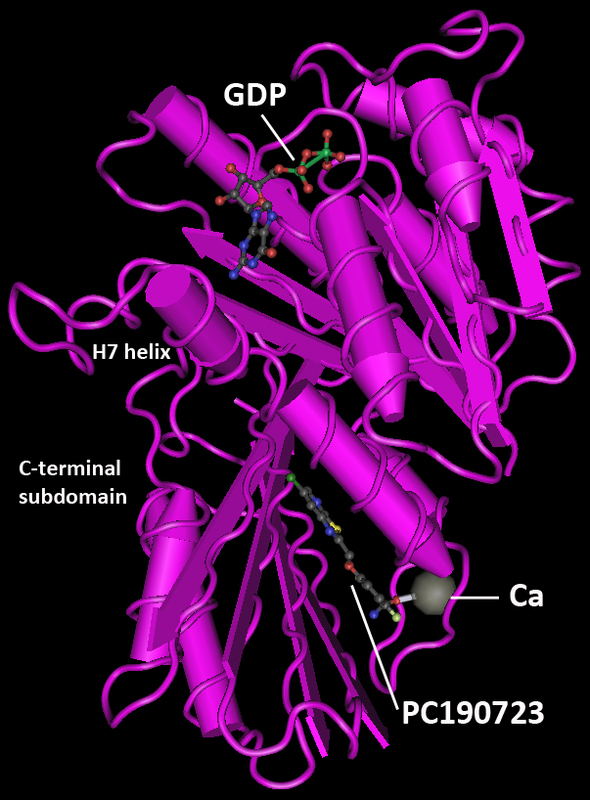 Tubulin secondary structure analysis, limited proteolysis sites, and homology to FtsZ. Biochemistry. 35, 14203-14215. Mukherjee A. and Lutkenhaus J. 1994. Guanine nucleotide-dependent assembly of FtsZ into filaments. J. Bacteriol. 176, 2754-2758. Panda D. et al. 2016. Identification of agents targeting FtsZ assembly. Future Med. Chem. 8, 1111-1132. Haranahalli K. et al. 2016. Recent advances in the discovery and development of antibacterial agents targeting the cell-division protein FtsZ. Bioorg. Med. Chem. doi: 10.1016/j.bmc.2016.05.003. Matsui T. et al. 2012. Structural reorganization of the bacterial cell-division protein FtsZ from Staphylococcus aureus. Acta Cryst. D68, 1175-1188. Elsen N.L. et al. 2012. Mechanism of action of the cell-division inhibitor PC190723: modulation of FtsZ assembly cooperativity. J. Am. Chem. Soc. 134, 12342-12345. Haydon D.J. et al. 2008. An inhibitor of FtsZ with potent and selective anti-Staphyloccocal aureus activity. Science. 321, 1673-1675. Haydon D.J. et al. 2010. Creating an antibacterial with in vivo efficacy: synthesis and characterization of potent inhibitors of the bacterial cell division protein FtsZ with improved pharmaceutical properties. J. Med. Chem. 53, 3927-3936.